There was a lot of talk recently about whether or not Seattle Seahawks cornerback Richard Sherman is a thug. I don't think he is. Generally speaking most thugs, in the most basic understanding of the word, don't attend Stanford or score 1400 on their SAT's. My snobby class bias aside though more importantly I think that your actions, not your words, hair style or skin color make you a thug. Speaking loudly and animatedly without cursing, about your success over a rival player after a big win does not a thug make. See a thug could be someone who body slams a school security guard. That would be Cass Tech QB and Michigan State University (MSU) verbal recruit Jayru Campbell, who was arrested for his actions in the video below. The security guard is of course somewhat fortunate to be alive as getting body slammed on a hard floor without any protection can lead to all sorts of bad outcomes, especially if your head impacts the floor as it did here. I didn't attend public schools until high school and certainly did not attend Cass Tech High School or MSU. Cass Tech has traditionally been considered one of the better public schools in Detroit but I've heard that in recent times (over the past 10-15 years or so) that's akin to boasting that you're the skinniest fat person at fat camp. My brother first brought this to my attention. He didn't attend Cass either. Smirk. Of course these things are not common but stereotypically this explains why people, black and white, racist or not, have been fleeing Detroit Public Schools. We hear a lot about about how certain people are improperly disciplined in schools and thus set up for a school to prison pipeline. That's true. A child who is boisterous, loud mouthed or questioning of authority isn't necessarily "disturbing the peace" or "special needs" or a "threat". The flip side of that though is that there are some children who are indeed threats and need to be removed from the school ASAP for the safety of others. Evidently Campbell was given second chances and missed them. So it is what it is. Of course in our society even where there is a video like this the accused is still presumed innocent until proven guilty. Just ask the cops who beat Rodney King. However, unless there is evidence that the security guard was assaulting Mr. Campbell or attempting to molest him or something like that I am not seeing how this ends well for Mr. Campbell. I think he gets expelled from school and convicted of any criminal charges. And I'm okay with that. I am both descended from and related to people who worked or still work in schools. I would hate to see something like this happen to them. Watch video below. The quarterback of the Detroit Cass Tech High School football team has been arrested in connection with an attack on a security guard. 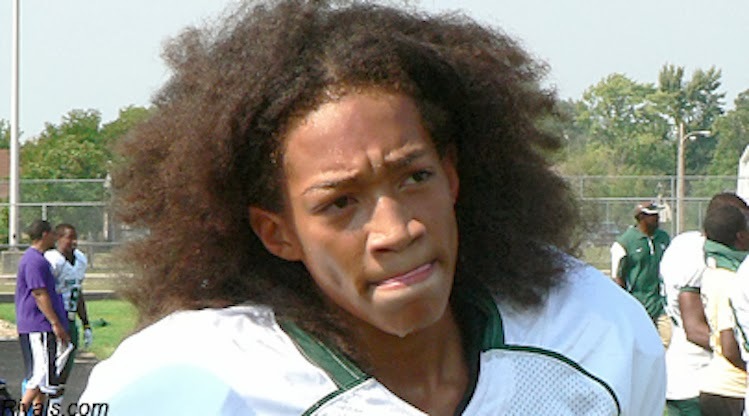 Jayru Campbell was arrested Wednesday by the Detroit Public Schools Police Department because of an incident that occurred inside Cass Tech at dismissal time. But in a departure from earlier DPS statements, district spokeswoman Michelle Zdrodowski said this afternoon that Campbell has not been charged, describing the earlier statements as a misunderstanding on the district’s part. In an e-mail this afternoon, Maria Miller, a spokeswoman for the Wayne County Prosecutor’s Office, said her office has now received paperwork on the case, but she cautioned against making any assumptions. “It would be premature to indicate what if any charges (we) will issue until we have reviewed the paperwork and a formal decision has been made,” Miller wrote in the e-mail. Campbell, a junior, verbally committed to play college football at Michigan State, but commitments are nonbinding until national letters of intent are signed in February 2015. Per NCAA rules, college coaches are not allowed to comment publicly on unsigned recruits. Campbell committed to MSU in August, turning down scholarship offers from Alabama, Notre Dame and Wisconsin, among others. He is rated as a four-star recruit by rivals.com. The alleged assault marks the second incident in recent months involving Campbell, who was suspended from school and for the first game of the 2014 season for throwing a punch after Cass Tech’s state semifinal loss to Novi Detroit Catholic Central in November. Do you think that Cass Tech should expel Campbell? Are you curious as to what Campbell's side of the story is? Should MSU reject Campbell because of this incident? Would you be willing to hire/work with someone if you saw them do this?